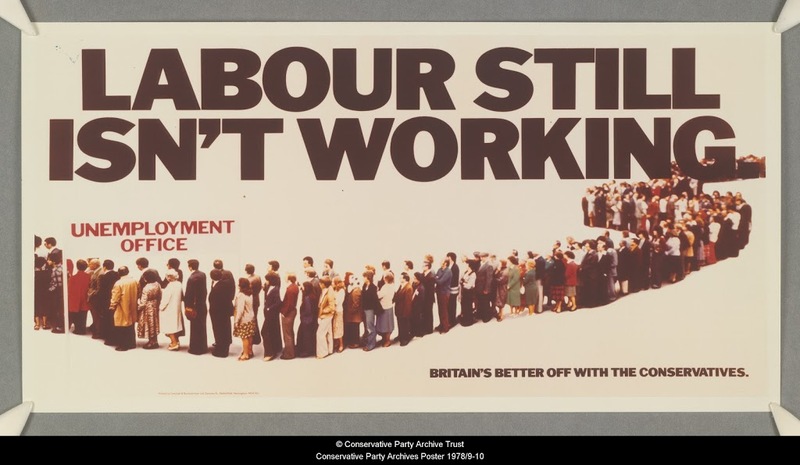 Above: One of the Labour Isn’t Working series of posters from the Conservative Party Archive Poster Collection. Below: Romney’s campaign poster. 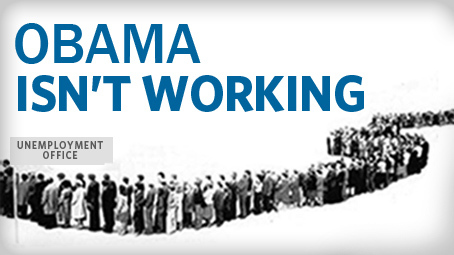 Those of you who are following the presidential election campaign in the US may have noticed Romney’s ‘Obama isn’t working’ campaign, launched last year. The campaign’s key poster is, as Romney calls is, a ‘tribute’ to one of the most famous British election posters. 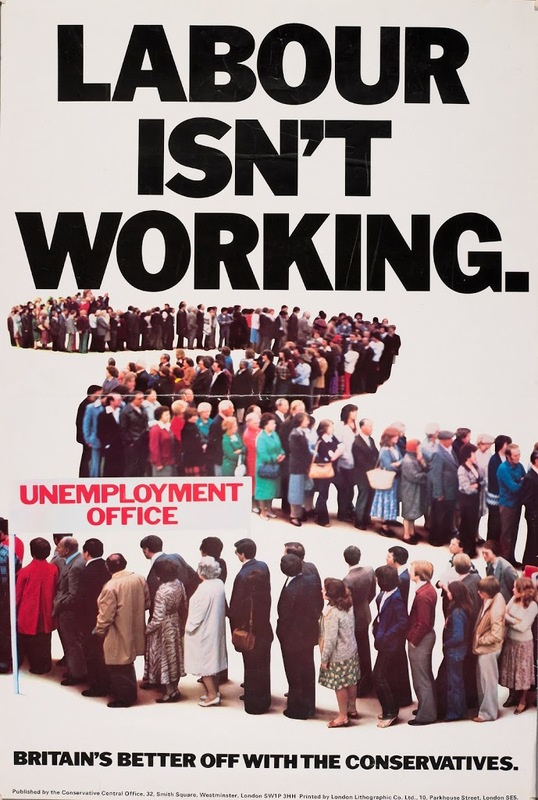 Saatchi and Saatchi’s Labour Isn’t Working poster, called the poster of the century in 1999, is still remembered by Conservatives and non-Conservatives alike. It proves one of the most popular images at each year’s Conservative Party Conference, and it appears regularly in the press as the emblem of an era. Romney’s campaign manager Stuart Stevens wrote a blog post explaining their choice to emulate the Thatcher campaign, which called a ‘historic political poster depicting the negative economic conditions and the government’s failed attempts to correct that path’. 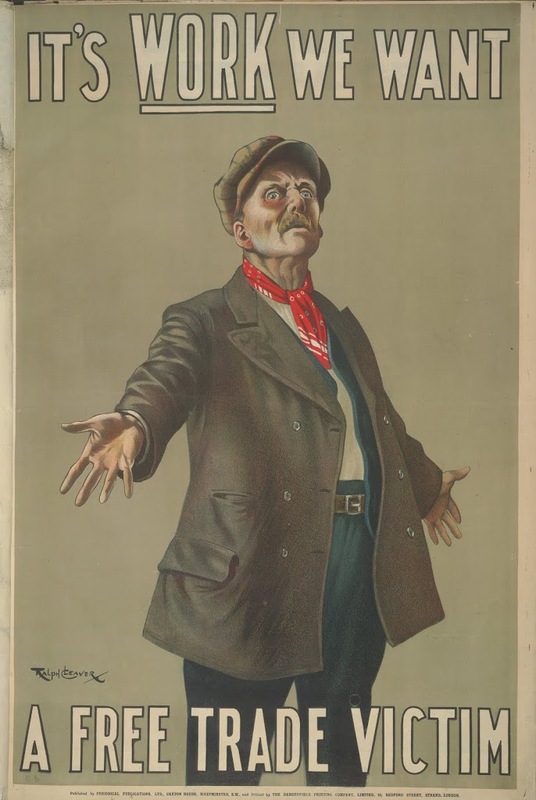 The original poster(s) addressed the rising rate of unemployment in Britain. The dole queue for the photo shoot was made up of Party members from Brent North and Hendon in north London. It was originally designed for an expected autumn 1978 general election; the election didn’t take place until spring 1979, and the poster was reused in various formats then. 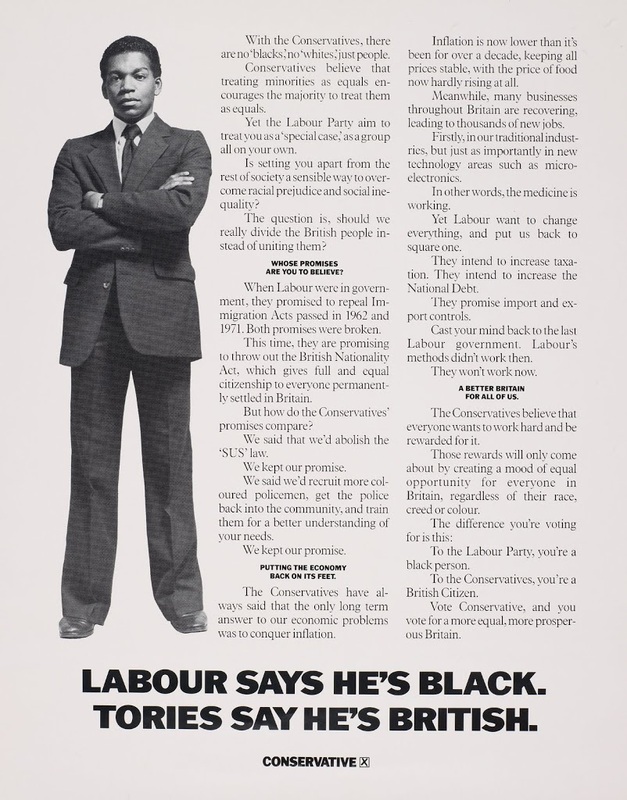 Dole Queues to Demons: British Election Posters from the Conservative Party Archive offers powerful insight into the impact of poster design on a political campaign. 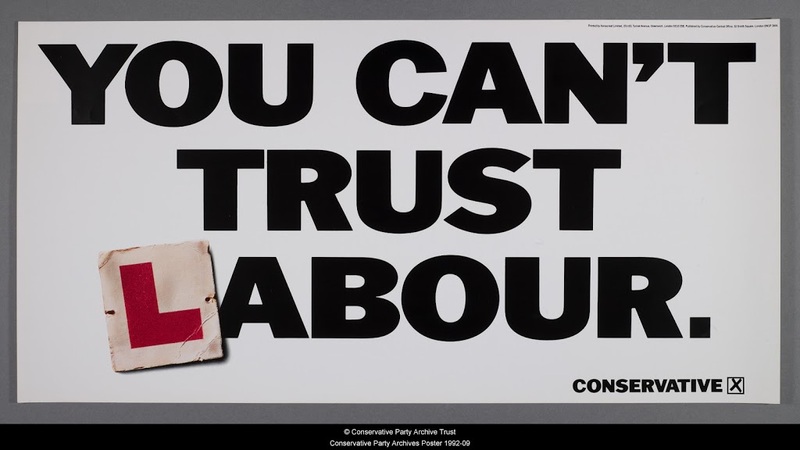 From the early Edwardian posters – colourful in both pigment and content – to the pointed posters of Saatchi in the 1980s, many of the political themes have remain the same, but the ways in which they were expressed had the power to make or break campaigns. Divided into chapters based on political periods, the book offers over 200 examples of posters drawn from the Conservative Party Archive Poster Collection. The images are accompanied by historical background written by Dr Stuart Ball, political historian from the University of Leicester, with a foreword by advertising guru Maurice Saatchi. The book will be available from the Conservative Party Archive stand at the Party Conference next month (stalls P10 & P11 – Hall 3 in the Party Zone) as well as from the Blackwell’s Bookshop stand. 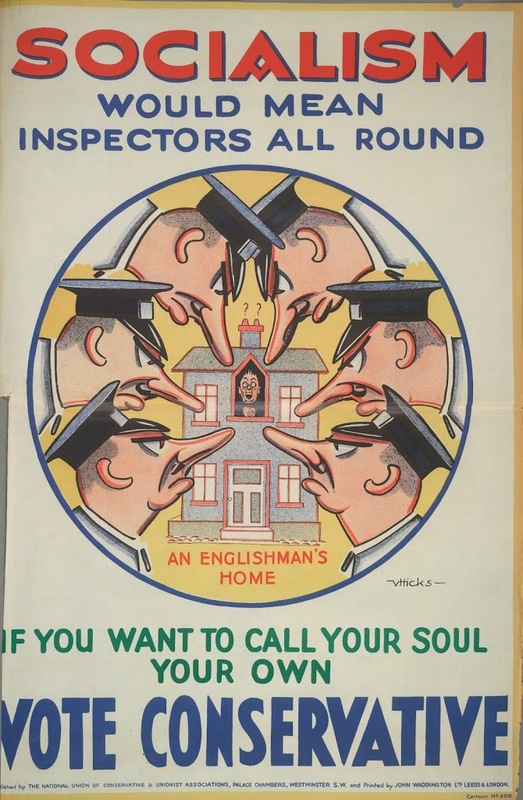 Dole Queues and Demons: British Election Posters from the Conservative Party Archive was featured in a brief Huffington Post piece and slideshow on ‘The Art of Elections’. It offers a sneak peek into a few of the posters we included in the book, which is now available through the Bodleian Library Bookshop as well as other major retailers. Just a quick note to say that the Conservative Party Archive featured prominently as a part of the Bodleian Libraries’ participation in UK Parliament Week. Parliament Week is a new national initiative supported by both Houses of Parliament that aims to increase awareness of Parliament and its work as well as encourage participation in the democratic process. The theme for this year was ‘Stories of Democracy’, and the Libraries highlighted items and collections relating to democracy and Parliament in the United Kingdom, from the Magna Carta to the Conservative Party Archive. In addition, Conservative Party Archivist Jeremy McIlwaine spoke to Culture 24 about the work and contents of the Archive; the interview is up on the Culture 24 website. Published 3 November 2011; see a preview copy and place your order at the Conservative Party Archive stand at the Party Conference, 2-5 October. 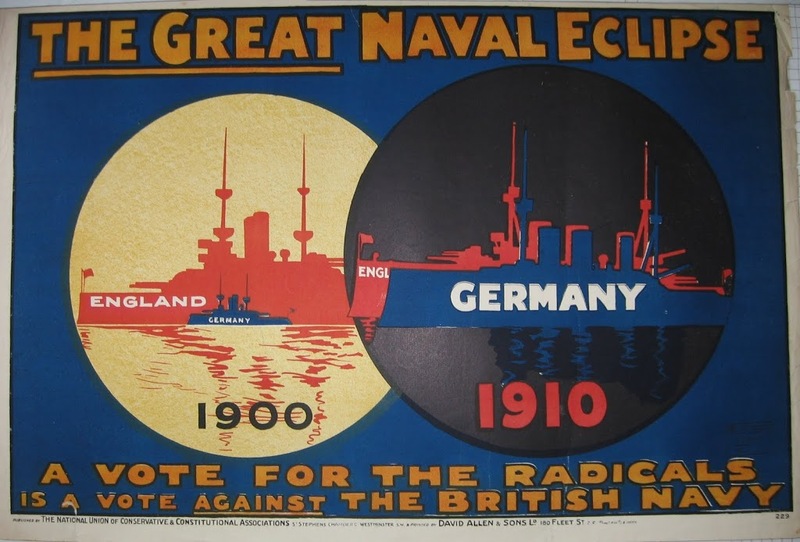 A unique blend of graphic design, bold art or photography and cunning psychology, election posters are an unsung art form, stretching back to the dawn of the twentieth century. 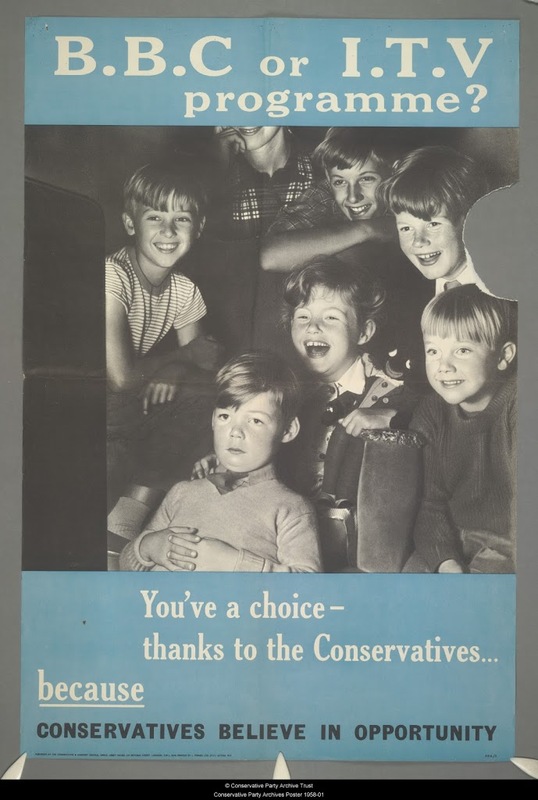 Exploiting the Conservative Party Archive’s collection of over 700 posters, this book charts the evolution of the Conservatives’ election posters. Divided into chapters along political periods, the book highlights the changing fashions in and attitudes to advertising, political ideology, slogans, combativeness and above all, propriety. Each chapter includes a brief introduction discussing the major themes of the period as well as captions explaining specific issues related to the individual posters. 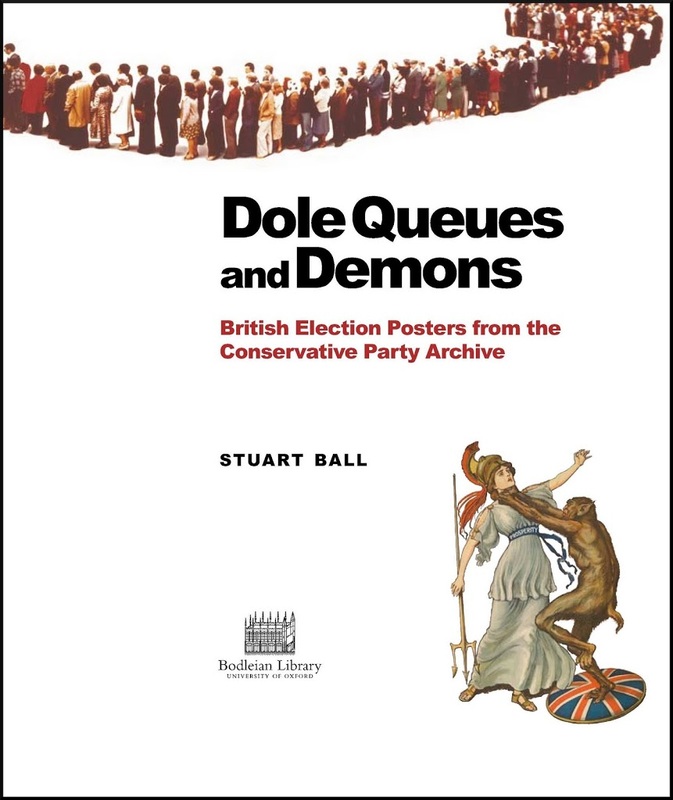 Lavishly illustrated, Dole Queues to Demons gives a fascinating insight into the issues and strategies of the Conservative Party throughout the twentieth century, and up to the present day. A foreword by advertising guru Maurice Saatchi discusses the posters from a communication and design perspective. This book will fascinate anyone interested in social and political history and modern communications. Published at a time when the advent of new media threatens to herald the end of traditional forms of mass communication, this book takes a timely retrospective look at this enduring feature of the British electoral landscape. ‘Rationing ends this weekend. Appropriate enough, the first day of freedom is July 4th – Independence Day. Gone are coupons, counterfoils, ration periods, registrations, and all the paraphernalia of Food Office rule. Here at last is the ‘Victory Day’ for housewives, wistfully anticipated by Dr. Edith Summerskill when she was at the Ministry of Food in 1946. Under a Conservative Government scarcity has been replaced by abundance, austerity by variety, restriction by choice, and frustration by freedom. At midnight on 3 July, the rationing limits initiated in January 1940 finally ended. Members of the London Housewives Association held a ceremony in Trafalgar Square to commemorate the occasion, while Minister Geoffrey Lloyd burned his ration book. 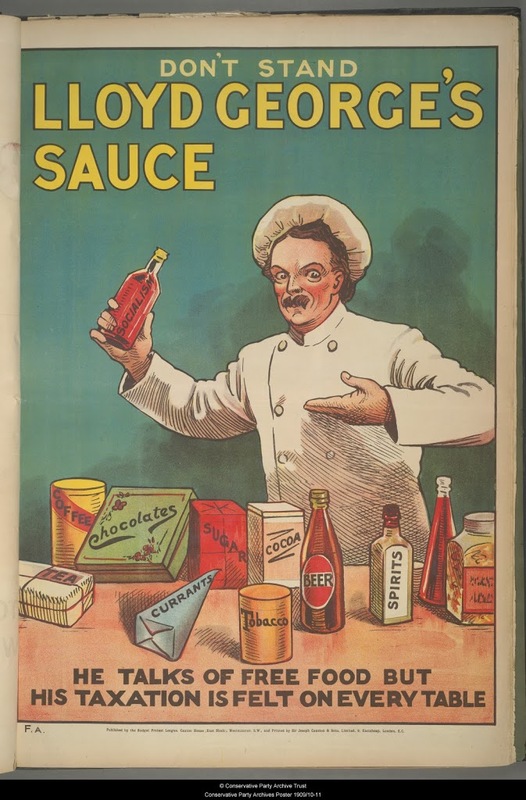 Rationing began in the UK on 8 January 1940 with limits on butter, bacon and sugar. Wartime efforts – including the North Sea blockade – made it difficult to ensure the availability of certain everyday provisions. Petrol had been rationed since 1939, and button and bacon were soon followed by meat, tea, eggs, sweets and more. By the end of the war, most common foodstuffs were limited as well as clothing, cigarettes and other necessities. Ration books (click here for examples) were issued to all citizens based on age and status (pregnant mothers, for instance, were often granted higher rations). 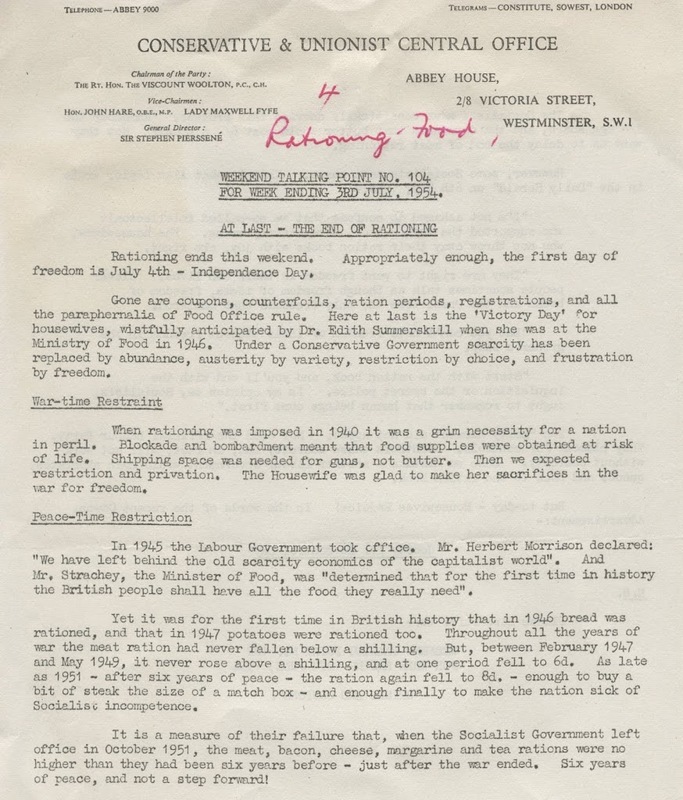 Citizens were encouraged to do their part on the ‘Kitchen Front’ and grow their own food; price gauging and unlawful rationing were subject to heavy fines. Nevertheless, people quickly tired of shortages. 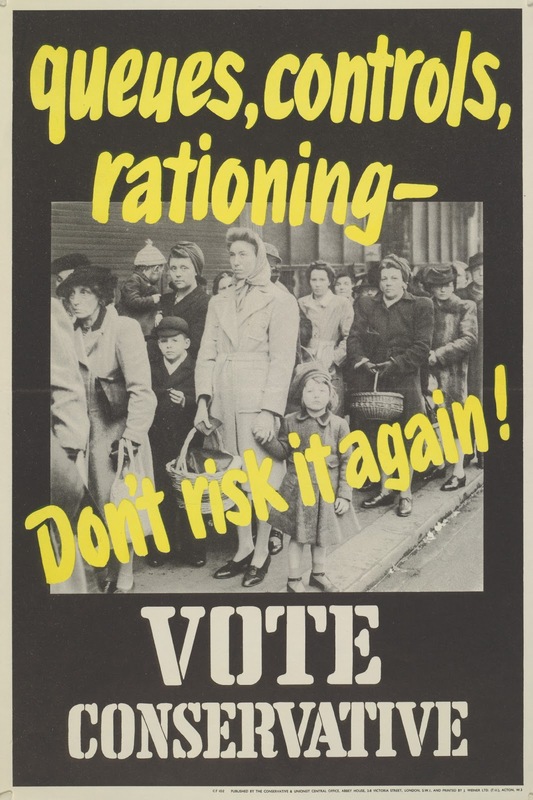 Rationing continued post-war as industrial action and rebuilding efforts in Europe disrupted the food supply. 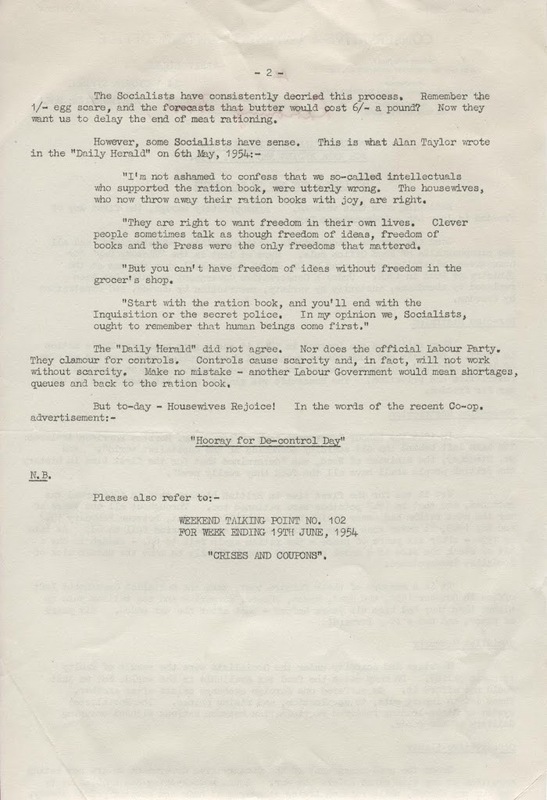 The Conservatives’ 1950 general election manifesto urged the end of rationing, which they portrayed as an effect of a Socialist government and ‘incompetence.’ Following a Conservative return to power in 1951 and the stabilization of the European economy, rationing was slowly phased out; meat was the last product to become freely available. The 2010 general election is now upon us! 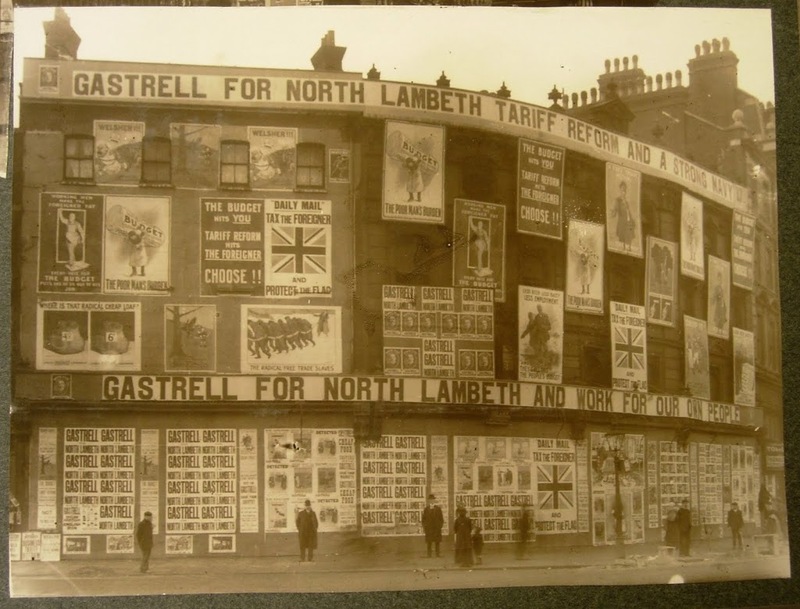 To mark the occasion, we’ve pulled out some posters and flyers from the 1910 election – just to give a snapshot of elections 100 years ago. There were in fact two general elections in 1910; the January election, dominated by disagreement over Lloyd George’s ‘People’s Budget’, resulted in a hung parliament and required a coalition between the reigning Liberals and the Irish Nationalists. Another election was called in December, but again, neither party managed to command a majority; the Liberals, led by H.H. Asquith, remained in place as the nation’s leaders, backed by the Irish Nationalists for a second time. Free Trade was on everyone’s minds; the electors were also worried about naval strength. 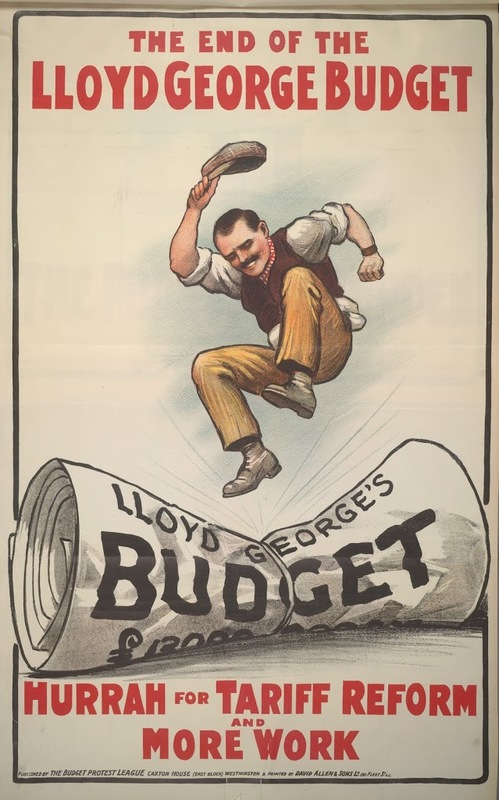 Lloyd George’s ‘People’s Budget’ proved extraordinarily controversial; it called for increased taxes, including a land tax, in order to pay for social spending in areas such as pensions. 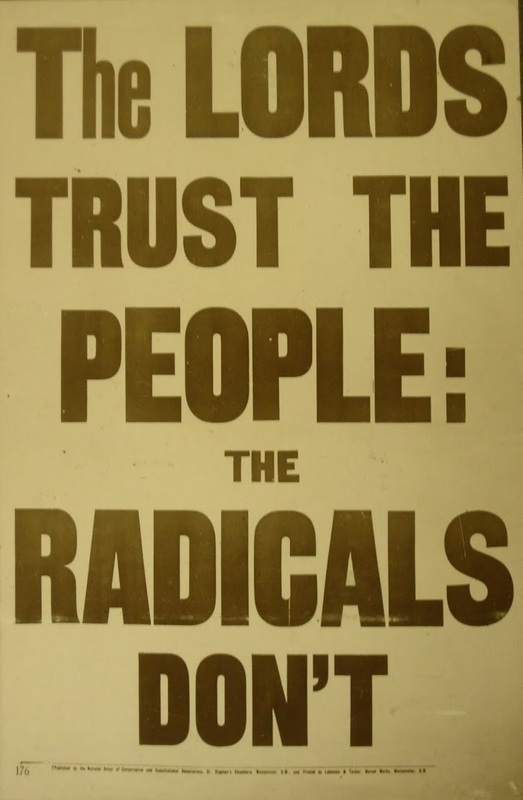 The House of Lords vetoed the Budget, leading to renewed debates over House of Lords reform – generating the sort of sentiments shown in the poster below. After a 13-year hiatus, Maurice and Charles Saatchi have returned to the Conservative Party campaign team (more information available from the BBC website). M&C Saatchi do not replace Euro RSCG, the Tories’ current agency, but will work alongside them in the run-up to the general election. 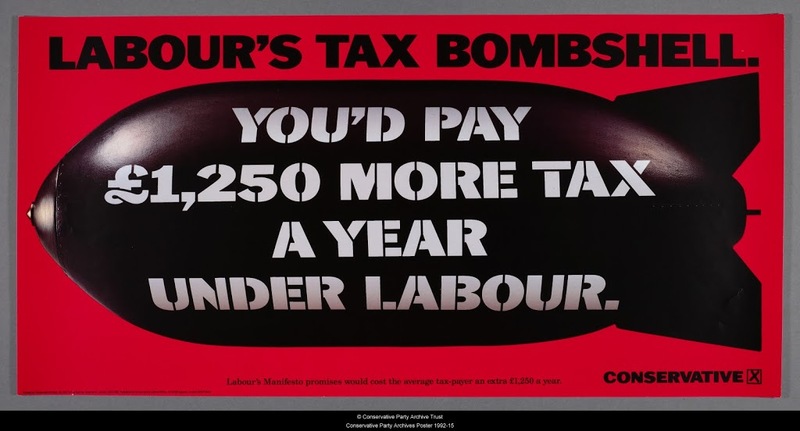 Saatchi & Saatchi, the brothers’ original company, was responsible for some of the most iconic campaign posters of the 20th century, from the 1979 ‘Labour isn’t working’, often cited as one of the factors that kept Margaret Thatcher in Number 10, to 1992’s ‘Labour Tax Bombshell’. Maurice and Charles Saatchi split from Saatchi & Saatchi, who now work for the Labour campaign, to form M&C Saatchi in 1995. 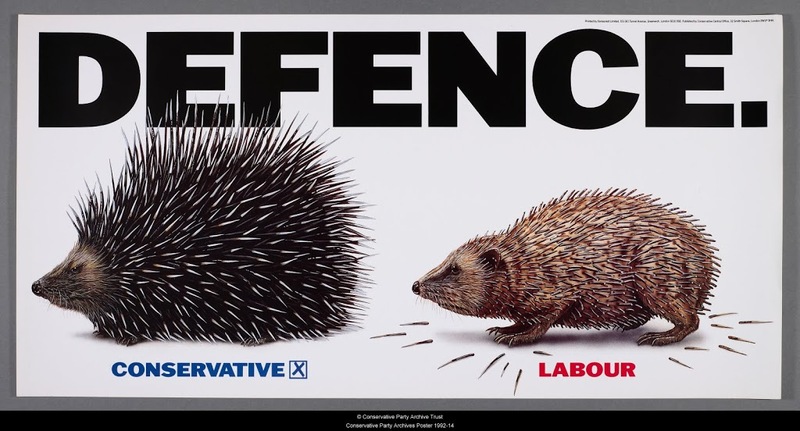 We’ve chosen a few representative Saatchi & Saatchi items from The Conservative Party Archive Poster Collection – please visit the Archive’s site to view more. If you’re interested in using them yourself, they’re available from Getty Images.